In May 1948, long before the Pali Tunnels made daily commuting from downtown Honolulu to the Windward side feasible, a small group of women gathered in the sleepy beach town of Kailua (population 3619) to organize the Lani-Kailua Outdoor Circle. More soon joined them and the Circle grew to more than 200 members within a few years. Photo at the top of this page shows LKOC members working on the Kailua Road median in front of the old Kailua Theater (at right), circa 1950's. Above photo of Kailua, circa 1940’s, looking makai, with Central Triangle in center. ​The Banyan in the Central Triangle was planted by Lucius Tuckerman in 1937. ​By 1950 Kailua had 7,740 residents, with new subdivisions sprouting in Keolu Hills, Kalaheo Hillside, and Enchanted Lake. Soon the group was instrumental in the landscaping and planting of over 2000 trees at the new schools being built, and along the streets of the new subdivisions. 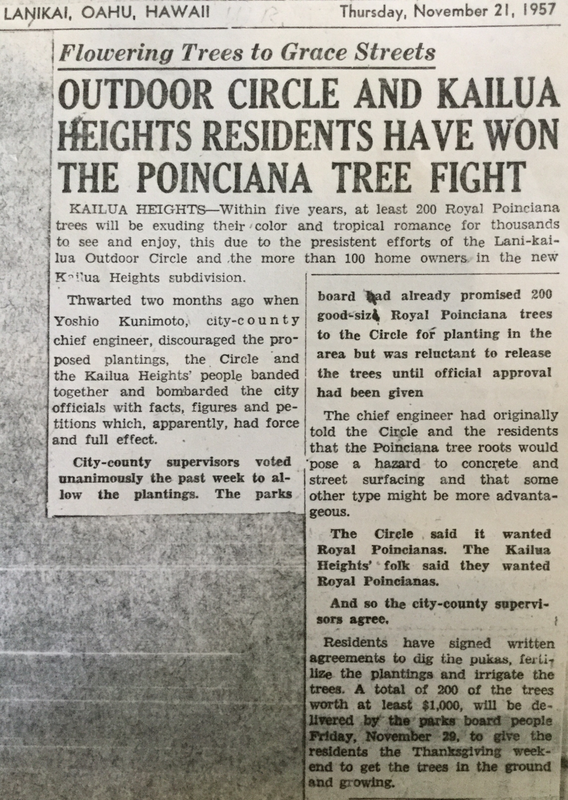 Below are articles from the Windward Reporter lauding LKOC’s efforts to plant 200 Royal Poinciana trees in the Kailua Heights subdivision, part of the newly developed Enchanted Lake and Keolu Hillside area. With the tunnels nearing completion, by 1960 Kailua's population had more than tripled to 24,402. Kaneohe Marine Base added another 6,397 to that figure. Our projects included assistance with planting at the newly built Castle Hospital and funds and labor to refurbish the Triangle Parks at Kailua Road and Oneawa Street, Kalapawai, and Lanikai. We fought open burning at the Kailua dump on Quarry Road. Kawainui Marsh preservation became an issue and we worked toward this goal. Our members spearheaded the eventual formation of the Kawainui Heritage Foundation in 1983. We worked for bike paths to connect Kailua neighborhoods, pushed again for planting of more street trees, and then kept them watered and trimmed. ​Our population of mostly young families was 33,783 in 1970, plus 7,860 more on the Marine Base. LKOC continued working to expand Kailua Beach Park, save Mount Olomana from development on it slopes, landscape the new Kailua post office, remove the Kapaa quarry roadside junkyard, and create height limitations for downtown Kailua. 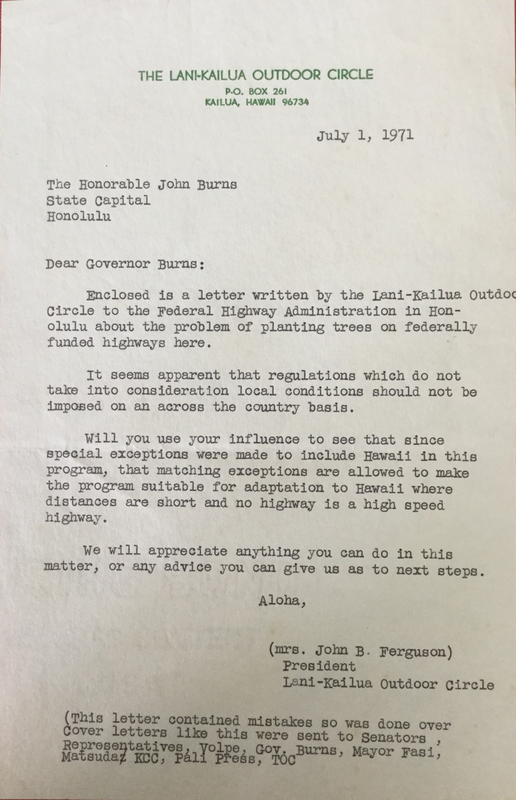 In 1971, LKOC successfully lobbied our City, State, and Federal legislators and officials to get trees planted in the median of Mokapu Boulevard, from Kalaheo Avenue to Oneawa Street, an area designated as a federally funded highway, in which median strip tree planting was disallowed. Today the magnificent trees in that central median are a beautiful testament to the perseverance of our LKOC leaders at the time. ​In 1980 we had 35,812 residents (plus 11,578 Marines) and we successfully prevented the acquisition of Aikahi Triangle by developers, who wanted to expand the shopping center, and rerouted Mokapu Boulevard to its present position, creating the large tree-shaded park area you see at that corner today. 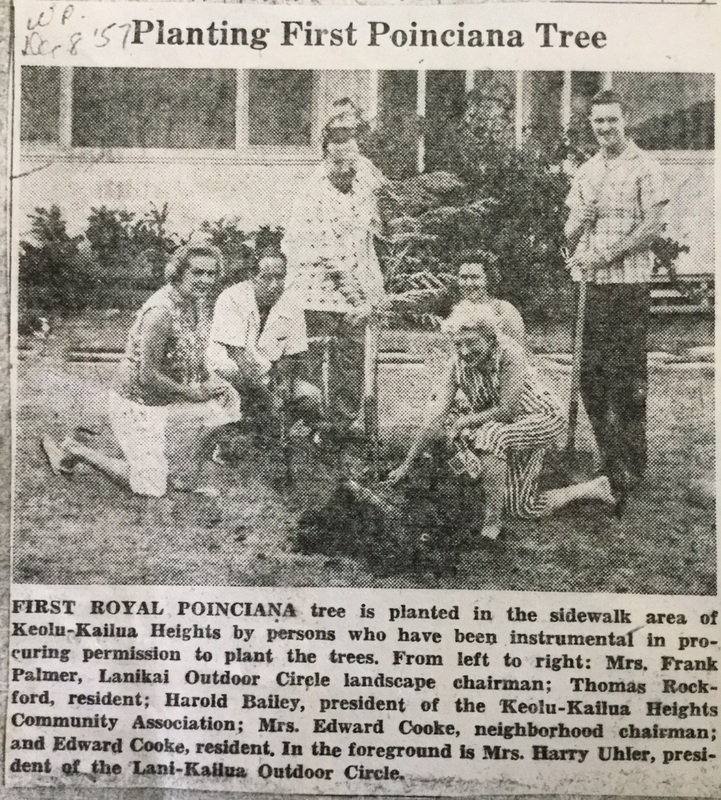 Below is an article that appeared in the Sun Press Newspaper at the time, describing our efforts. Also in the 1980's we pushed for trees in the medial strip along the entirety of Mokapu Boulevard and were were successful in facilitating the city's acquisition of the Boettcher Estate/Kalama Beach Park. (LKOC currently has adopted Kalama Beach via the City and County's Hoa Paka Program, and we do regular maintenance there). By 1990, Kailua's population had stabilized at 36,818 residents and 11,662 Marines. Our projects included a major landscape project at Alala Point at the entrance to Lanikai, and landscaping of the corridor leading into Kailua town, refurbishment of the Pohakupu fountain and park landscaping, protection of Kaiwi Coastline from development, preservation and replanting of trees at Kailua Library, and expansion of Kailua Beach Park to its present area near the boat ramp. The Kailua Christmas "white lights" decorations were begun by LKOC in this period. This project at the entrance to Lanikai was planned in 1992, (see article at left in the Windward Sun Press), and completed 1994. Since 1999, as part of our LKOC/WCCC Partnership, the WCCC Community Service Work-line women have been performing this regular maintenance. Above photo shows the area today. In 1993, LKOC held the first "I Love Kailua" Town Party which has grown into a full-scale annual community event. This has been our major fundraiser, where proceeds are used for landscaping projects throughout Kailua town. Please visit our "I Love Kailua" Town Party page for more details on this event. In 1993, as part of our educational outreach goals, LKOC began its scholarship program with Windward Community College. Since then, we have given yearly scholarships to more than 80 students enrolled in Agricultural and Environmental Sciences Programs there. Please visit our WCC Scholarships page for more details on this important program that helps the next stewards of our land and natural resources. We are proud of the horticultural training programs at the Women's Community Correctional Center (WCCC) created by LKOC in 1999, where the women in our "Learning to Grow" program learn skills which will help them find jobs upon release. 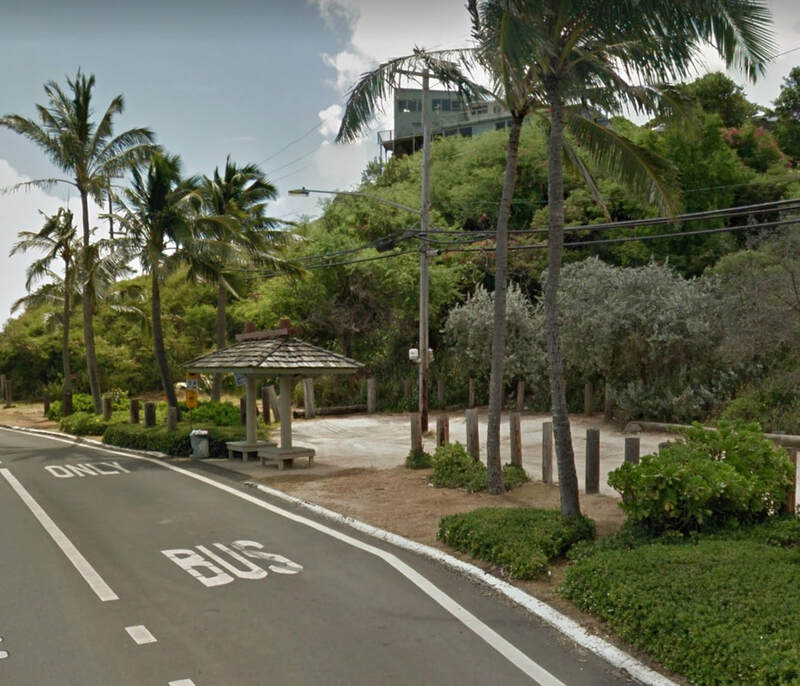 In return, they maintain some of Kailua's roadsides and parks, thus saving many taxpayer dollars. Please visit our LKOC/WCCC Partnership page for more details on this life-altering program, and how you can get involved as a volunteer. It is a truly rewarding experience. In 2000, Kailua’s population remained stable at 36,513 residents and with 12,000 military personal at MCBH. LKOC continued is planting and landscape maintenance projects within the community. In the early 2000's, we installed new plants at Kailua Post Office and Hawaiian Tel building on Kuulei Road, and planted silver trumpet trees in the municipal parking lot between Maluniu and Aulike Streets. We replaced the dead Wiliwili trees with shower trees on Mokapu Boulevard in 2007. We are proud of our latest landscaping projects at the Pali Palms and Kalapawai Triangles at either end of Kalaheo Avenue, which we have been maintaining for the city since 2010 and 2012 respectively. Please visit our LKOC Projects and our LKOC Accomplishments pages for details on the many projects and activities we have been involved in over the years. In 2010, Kailua's population was 38,635, with 9517 military personnel. In addition to our tree planting and beautification efforts in Kailua, we continued to advocate for adherence to our State's exemplary sign laws regarding outdoor and aerial commercial advertising, as well as actively advocated for responsible development, limiting commercial activity at our beach parks, and the preservation of the Kawainui/Hamakua Marsh. Please visit our Signs, Public Affairs and Advocacy, and Kawainui Marsh pages for more information about our important efforts here. Recently, in 2017, we adopted Kalama Beach Park through the city's 'Hoa Paka' program, and do regular volunteer workday maintenance there, involving removal of invasive species, and major landscape trimming, pruning, and cleanup. As part of our educational outreach efforts, our LKOC volunteers continue their mentoring program at WCCC, with new and enriching opportunities for the women there. Please visit our Volunteer Opportunities and LKOC/WCCC Partnership pages for more details on how you can get involved in our workday projects, as well as in the "Learning to Grow" Program at WCCC. We continue to be actively involved in the maintenance and enhancement of our urban tree canopy through the planting of new trees in our public spaces, as older ones are removed due to age or disease. By working with other like-minded organizations, as well as State, County, and municipal entities, we have made a difference! Please visit our Trees page for more details on our activities in this effort. While ours is a volunteer organization, much of what we do requires major funding. To raise money for these projects, we sponsor the "I Love Kailua" Town Party, which is open to the general public. This event raises funds through our LKOC plant sales, LKOC Town Party t-shirt and button sales, and food vendor sales, as well as raises awareness of beautification issues in our community. These activities and your contributions in support of our organization are what make it possible to continue our work toward the goal of "Keeping Kailua Clean, Green, and Beautiful." To join us, or support us, please visit our Join The Circle page! We would like to say Mahalo to all of our generous supporters and sponsors, our dedicated volunteers, and all those who support our mission here in Kailua and on the Windward side! LKOC ~ Dedicated to "Keeping Kailua Clean, Green, and Beautiful!" since 1948! Pohakupu Park: Perimeter royal palms, interior pathways (landscape design, irrigation, installation). (1991,1998). Kaimake Loop Park: Hawaiian Kou trees (landscape design, installation). Kalama Beach Park Boettcher Estate: Naupaka (landscape design, installation 1999; and quarterly maintenance of property grounds (2016-present). Mokapu Blvd: Oneawa to KMCAS back gate: Coconut trees (1967); Narra, Rainbow Shower, Monkey Pod, Palms (purchase and installation) (1982-1985, and 2010). Kailua Corridor Phase I, II: Oneawa to Waimanalo Junction: trees, palms, naupaka (landscape design, installation and on-going maintenance of Phase II from above dike road to Hamakua Drive 2000-present). Kailua Central Triangle: Planting and irrigation installation and maintenance (1950’s, 1990's - 2005); proposed re-landscaping 2016). Pali Palms/Aikahi Triangle: Coconuts palms, croton, lauae (landscape design, irrigation, installation (2011)) (on-going maintenance 2011-present). Kalapawai Triangle: Landscape design and installation (1969-1970); Re-landscape design, irrigation, installation (2010) (on-going maintenance 2010-present). Alala Point: Plantings: (landscaping, irrigation, installation (1998) (on-going maintenance 1999-present). Kailua Library parking lot plantings and trees (landscape design, installation, 1991). Maunawili Pumping Station: Kukui trees (landscape design, installation). Kailua Sewer Lift Station: Kainehe/Kailua Road: Coconut palms (installation). Women's Community Correctional Center Exceptional Monkey Pods (on-going maintenance 2004-present). Kailua Recreation Center parking lot: Luolu palms, Shower, Autograph trees (landscape design, installation, (2008); mulching (2014)). In collaboration with DOT, City and County, and State entities. Funding through private donations, foundations, and fundraising campaigns. Our efforts involved surveying, designing, spearheading installation, performing maintenance. Street Tree Plant Materials came from C&C list of acceptable street trees and native plants from their Waipio nursery. Sustainability: LKOC contracted with Board of Water Supply to pay on-going water bills on several projects.